You know how there are some people who can never make a mess, no matter how much of a mess they make? Everything they touch becomes lovelier; they are artful even in the way they sweep up the leavings of their work. How does this happen? Perhaps it is something inherent in the beauty of the handmade. All the ingredients fall into the proper place, even the ones not used. Each individual thing is enhanced in its relation to the whole. 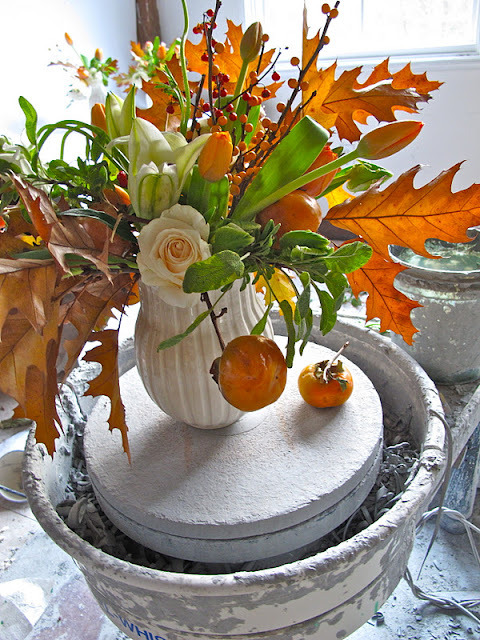 Amy Merrick is a young florist in Brooklyn whose work in design*sponge I have admired for a while now. I was quite surprised last weekend to walk into my pal Frances Palmer's studio to find this sylvan creature at work composing bouquets. She was using tulips, roses, lilies, and persimmons, and ferns, and oak leaves burnished with rich amber; she had gathered them that morning from the fallen branches in Central Park after our terrible autumn snowstorm. Amy seems like such a shy, woodland creature that at first I didn't even introduce myself; she was focused on her work, pulling ingredients in and out of bouquets for Frances' dinner tables; every year, Frances' holiday studio sale ends with a Ladies Dinner (but you can buy her handmade work online too). The din is remarkable--and so is the dinner. When Amy and I finally did talk, I was amazed to learn that she had first seen Frances' work here at Slow Love Life, and had determined then and there to meet Frances. So she did. And now I introduce all of you to Amy--she has a beautiful piece about making holiday wreaths up at design*sponge this morning. I was especially touched by Amy's stories about her grandparents and their home in New Hampshire; her grandfather seems to have understood, even when she was a little girl, that she was one of those rare, visually gifted children, and he sent her clippings and pictures and all sorts of treasure to feed her imagination. She loves their family home in New Hampshire just about more than anything else, and says it is her dream to spend the rest of her life tending it. I love Amy's blog, An Apple a Day--her recent piece on a wedding in Millbrook was dreamy. As for Frances. She's another who simply cannot make a mess look anything other than gorgeous. Her sale was a success, as always, and there's still plenty of work for sale up online--as Frances never stops making pots. And! Frances has agreed to make another holiday ornament for readers of Slow Love Life--I think with a second year, I can now declare that this will become an annual tradition. Last year's version is just about sold out (two left, at last count.) The new one will be up online here in a week or so--send Frances an email through her site if you want to be on her list or if you want to pre-order multiples! I enjoyed Frances' interview this year in design*sponge as well; it is terrific that she was introduced to new audiences around the world. 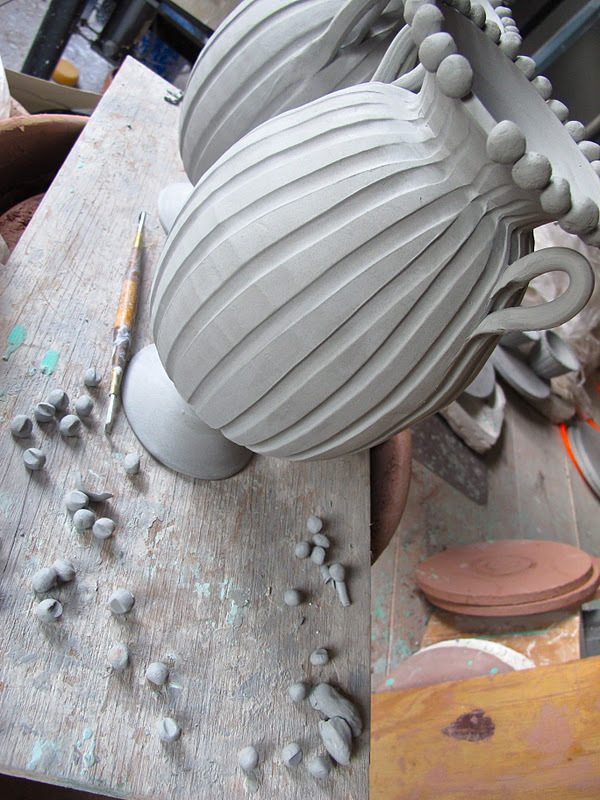 I love watching the creation of something--whether it is a fabulous meal, or a beautiful bouquet, or a handsome pot. I love watching people weave, or knit, or sew, or work needlepoint. My soul was early imprinted with a vision of my beloved Kentucky grandmother making dresses or piecing quilts. I will never forget lying down on brown paper, my grandmother outlining my little body with a heavy fat pencil, so that she could cut a pattern to fit me. It was magical, watching dresses rise up out of that brown paper. Will our children remember things like this? Absolutely not. Most of us didn't make our clothes or throw our own pots. BUT! One of the most fabulous things about Young People Today is the passion they have for craft, for food, for gardening, for Do-It-Yourself. Quite entrancing. Maybe it has arisen in response to my generation's having turned away from such things. I fell head over heels for this handsome cake stand, but did not feel that I deserve to own it, because I do not make cakes. I hope it finds its rightful owner soon--and I do believe that things call out to find the right people to take care of them. There's something deeply satisfying, and profoundly moving, in seeing that human hands and hearts have left a trace on earth or flesh or flower.